The Pentland Firth, the narrow channel between Northern Scotland and the Orkney Islands, has been hailed as both the 'Holy Grail' and the 'Saudi Arabia' of British renewables, because of the massive amount of kinetic energy in its swift-moving currents (up to 12 knots). Many aspects of the Pentland Firth mark it as unpromising 'green energy' territory. But a combination of world, British and local factors have come together to suggest that it will be an important source of UK renewable electricity-generation; perhaps 1,200 MW installed capacity by 2020? As well as the 'driver' from $100+ oil barrel prices, plus fears of humans enhancing 'global warming', there is a 'new' hypothesis tantalisingly suggesting that its tidal streams can provide base-load electricity, dependent on the layout of generating-device 'arrays'. For reasons of recent history, the economy of Caithness (popn. 26,000, nearest city Inverness c. 110 m/176kms.away) is more energy-dependent than Houston's. It is a base for several high-standard national, international and local engineering businesses; there are hundreds of qualified local persons working in the world wide 'oil patch', most with skills adaptable to tidal-stream work. But as the UK's most audacious 20th century's 'electricity self-sufficiency' experiment ends at Dounreay, Caithness, the Pentland Firth is hailed as the most likely means of retaining this 'remote' community's energy skills. Caithness has been a centre of energy research and development since UK 'fast breeder reactor' atomic work got under way at Dounreay in the late 1950s; now that nuclear park is being 'decommissioned' (i.e. safely demolished) with the current 2,000 + jobs dropping to a handful by 2025. Complementing this on the Firth's Orkney (popn. 20,000) shore is the publicly funded European Marine Energy Centre at Stromness, used for testing/evaluating separate companies' marine power prototypes. It has a unit for analysing sub-sea tidal stream devices. The UK's second-largest crude-oil transfer terminal is at Flotta, in Scapa Flow, Orkney. It is the velocity of the semi-diurnal (twice-daily) tidal streams, that mark the Pentland Firth out from other straits, holding out the possibility of 'horizontal hydro ' electricity generation on a scale unavailable elsewhere in the UK's territorial sea; perhaps up to 10,000 MW or more, as the UK's biggest single renewables asset. The open-ended Pentland Firth is between 6 to 8 miles (9.7. to 12.9 kms) wide, narrowing at its eastern end where the tidal streams run most swiftly. Its average depth is between 60 to 70 metres. The channel stretches from a line between Dunnet Head, Great Britain's most Northerly cape, and Tor Ness on Orkney isle of Hoy for 17 miles eastwards (27.2 km) to the Pentland Skerries, mid-Firth islets, off the summer foot-ferry route between John O'Groats and Burwick, Orkney's southernmost extremity. The Firth is like a mighty reversible Amazon (the volumes of moving water are comparable). The Atlantic Ocean seems to empty itself into the North Sea during the east-flowing flood tide, while the reverse occurs on the west-flowing ebb phase. But nothing concerning the Firth's tidal 'regime' is simple, or often easily explicable, precisely why mariners have feared transiting its waters since ancient Classical times. Rocky headlands jut into its tide-streams. Mid-Firth islands further distort its flowing waters to form eddies and whirlpools; the topography also causes inshore counter-currents, called 'burths'. In parts, there is an irregular, shoaling, rocky seafloor. This causes tide-races (e.g. The Bores of Duncansby, off John O'Groats, on the flood; the Merry Men of Mey on the ebb) where waves break daily, even when the surrounding sea-surface is flat calm. The Firth lies in one of the world's windiest zones. Heavy swells driven by prevailing westerlies from the Atlantic occur regularly; so much so that surfers cherish the 'breaks' at its Western end as the finest in Europe, holding world championship events in Thurso Bay. Less frequent are the short sharp, but sometimes destructive, swells emanating from the North Sea. When gales oppose the tide-streams, particularly over the 'races', the resultant confused broken high seas can cause alarm. The strength of the tidal-streams depends on the stage of the fortnightly lunar cycle with maximum velocity at the 'springs' coinciding with the full and new moon; minimums are on the 'neaps' at the moon's quarter-phases, when its gravity pull on the Earth's surface is weaker. The scale of the energy challenge is immense; no one pretends that extracting 'horizontal hydro' will be easy, or it would have been done by now. Nor will it be cheap; capital costs in the early demonstration phases will be relatively high, although partially balanced by free, everlasting, fuel. Local sailors had a well-deserved reputation for superb seamanship during the era of wind-powered ships. They used little clinker-built wooden 'yoles' powered by sails and oars built locally to Viking-era designs, made beamier to cope with the Firth's tidal streams. The open 'yoles', typically 5-6 metres long, were launched from beaches, serving the Firth's coastal and island communities for centuries as key cogs of local life providing both cash income and food; every youth had to learn to handle them safely, while taking advantage of its tidal-streams as required. The 'yoles' allowed local men to access windjammers at the Firth's approaches to provide a safe passage for merchant ships; marine insurers insisted on pilots being hired, on pain of refusing cover. By tacking, those pilots could sail 'their' vessels into the wind, but never against the tide-streams; thus they had learn to extract every last advantage from the currents. Those boats acted as 'dories' for hand-line cod-fishing all over the Pentland Firth; salt-dried cod, exported to Mediterranean lands was, with pilotage, a staple of its economy, especially in mid-Firth Stroma. The isle was home to 300 folk a century ago; it has been deserted for 50 years since trawlers at the Firth's approaches decimated cod-stocks. Such fishers had to maximise the time spent in 'slack water' on the tide-turn to let each line's lead weigh sink to plumb the seabed, prior to hooks being hauled back a few metres above the floor to the 'catching zone'. The same 'cockleshell' boats acted as ferries for carrying persons, livestock or goods; again a sound knowledge of the tidal streams was a prerequisite. Before harnessing the Firth for electricity can begin in earnest, this local know-how, peaking in Victorian/ Edwardian times has to be regained by both by modern methodology, including co-ordination of information held by Government agencies, and accessing residual knowledge amongst present-day regular Firth users; safety of powered small boat work there continues to need some of these skills. The Pentland Firth remains an important trade route, linking N.W. Europe to N. America and beyond, annually carrying billions of pounds-worth of liquid and solid bulk cargoes plus container ships. It lies wholly in British territorial waters, but the UK Government's signature of a UN agency (International Maritime Organisation) 'protocol' allows vessels of all countries a 'right of free passage'. Some of the world's biggest crude-oil 'supertankers' (VLCCs) ply the Firth to access Scapa Flow, often used for 'trans-shipments' from up to four smaller tankers; constraints in the Panama Canal has led to some Far East manufacturers moving goods via Canada's transcontinental railroad for onward transit at Halifax, NS, into massive container ships sailing to NW Europe, via the Firth. Thus generating devices piercing the sea surface are likely to be ruled unsuitable for the Firth's main channel, as are those failing to provide a clearance of at least 15 metres. A 'plus' for future Pentland Firth electricity is that the tides are entirely predicable, unlike weather-dependent sources (e.g. wind or wave power) and that generating sets will be beneath the sea-surface, so invisible from the shore. A 'downside' is no electricity can be generated during 'slack-water' at the tide-turn; normally that would mean a dependence on off-site 'pumped storage' hydro, or an energy-intensive onshore use (e.g. mass data processing, electrolysis of chemicals such as hydrogen or ammonia). A feature of the Firth is that tide times vary widely in short distances both along the shore and into the main channel. In mid-Firth, high water can be occur over 2 hours later than on the shoreline, where there can be an hour's difference in a distance of 3-4 miles (5 to 7 kms. ); tidal stream flows are intimately linked to this. This is most obvious at Scapa Flow, whose main sea access is via 'sounds' (i.e. narrower channels) off the Pentland Firth's main through shipping lane. The eastern entrances to this 'inland sea' were blocked off by the Churchill Barriers (built 1940/5). The causeways now carry Orkney's inter-island road network. They are key links for those using the year-round vehicle ferry from Gills Bay, in Caithness, and for summer passengers from nearby John O'Groats. High water occurs c. two hours later on the east side of the Barriers than on the west; this is because the archipelago splits the regular tidal 'surge', with most rushing through the Firth, but the rest forced between Orkney's isles or around its top, before heading back southwards into the North Sea. Billy Magee is treasurer of the community-owned small harbour at Gills Bay, four miles west of John O'Groats, from where a new-build �10 million catamaran RO:RO ferry will replace the present vessel on the 'short sea' Pentland crossing in July, 2008; this is Scotland's only private island-link ferry; its state-owned competitor needs c. �10 m. annual subsidy to stay 'afloat'. He has fished locally for lobster/crabs from his powered 'yole' for most of his life; he played an important role in seeing a RO:RO service being re-established at Gills. Now several companies are appraising Gills Harbour, the nearest port to the best tide-streams, for cable-landing, device-servicing etc. The 'Magee hypothesis' is that the difference in high-water times over short distances can be used to advantage to provide generation at all times (essentially 24/7). By adding electricity from tide-streams around Orkney, the minimum output could perhaps be enhanced. This deserves early testing, as base-load electricity is much more valuable than interrupted supplies. Islander's son William Simpson is sheep-farmer on Stroma; crossing from Gills as the agricultural calendar requires. His tidal know-how is in demand from promoters of several devices. David Simpson (no relation) has just taken delivery of the Pentland Firth's first catamaran creel-boat (crabber). He has diving experience and believes that early devices should be placed in the Inner Sound, on a line from John O'Groats Mill to Stroma's 18th century Kennedy mausoleum. He agrees that the Magee hypotheis is likely to be proven. The words Pentland Firth' and 'electricity' were first mentioned together in an obscure pamphlet by playwright/philosopher George Bernard Shaw in 1908; the same year as local man William Tait returned from a lifetime's geology/mining work in 5 continents, including two gold rushes and early Alaska petroleum drilling, to reveal his hunch that oilfields lay under the North Sea. In early 1947, while Britons shivered in blackouts in sub-zero temperatures due to snowdrifts and frozen rail points interrupting supplies from the coal pits to power stations, 91-year-old Shaw wrote to The Times suggesting that the Firth's streams 'could power half of Europe'; he had often crossed the Firth for trout fishing holidays in Orkney. In 1993, staff at the Government-backed Energy Technology Support Unit (ETSU) at Harwell, Oxon, conducted the first appraisal of the UK's likely tidal steam resource; it pinpointed the Firth as having the most active 'regime'. No-one can yet know what proportion of the resource can be extracted, while keeping environmental effects to zero, or negligible; but flume-tank tests should help with an answer. At Harwell in Oxon in 1947, atomic physicist German-born Klaus Fuchs suggested another 'antidote' for the problems exposed by the 20th century's severest winter; 'fast breeder reactors'; a working party was established. In December 1952, Britain suffered its worst 20th century environmental disaster when the 'Great London Smog' caused c. 12,000 early deaths; that clinched the atomic programme. Construction was under way at Dounreay by 1955 after local Conservative MP Sir David Robertson found himself uniquely placed to influence its establishment there; the currents of the Firth's western approaches were a factor for liquid radioactive effluent removal. The theory was disarmingly simple; 'depleted' uranium (over 99% of any 'raw' ingot) could be transmuted (alchemy-style) by radiation bombardment in a fast reactor's core into plutonium; in turn this man-made metal could be recovered (reprocessed) from the 'breeder banks' to provide fresh fuel to keep the process going; the heat generated would be removed from the reactor by liquid metal (sodium) that in turn would super-heat steam to spin the generating turbines. The 'catch' was in the need for recovering ('reprocessing) plutonium, when the fuel rods became 'dulled' and safely extracting it from the 'breeder' rods. This was successfully overcome; but problems at the interface between the (non-radioactive) 'secondary' sodium loop and steam/water dogged every 'fast reactor' yet built; the British experiment was discontinued in 1994, but France, Japan, China, India and now Korea persist. The initial 15 MW Dounreay reactor, inside its massive spherical 'dome' was fired by highly-enriched uranium to provide designs for the experimental plutonium-burning 250 MW Prototype Fast Reactor (PFR), that the Labour administration announced in 1966; a key part of Prime Minister Harold Wilson's 'white heat of technology' initiative. The Dounreay site was a sophisticated 'nuclear park' with an array of high-tech engineering, fuel-rod re-processing and manufacturing plants; very strict tolerances applied, with 'exotic' metals being machined to contain fuel-rods operating in extreme temperatures. Key work was done there on the commercialisation of Britain's 'Advanced Gas-Cooled Reactors' (AGRs), the backbone of the country's atomic power station 'fleet' since the 1970s. During its 1960s/1970s heyday, Dounreay's 'Engineering Development Unit' acquired a worldwide reputation for innovative excellence; accurate liquid 'flow' instrumentation remains a lasting legacy. Electricity from Dounreay PFR was interruptible, so the then Hydro Electric Board (now Scottish& Southern Energy) built a 'twin' pump storage power station at Foyers, Loch Ness, to add value. Most importantly, a 125 kV line extended the National Grid to the North Coast to transmit electricity to Inverness (Beauly) from where it could be sent to Stirling (Denny) by an existing 132 kV line. A proposed 400kV replacement for Beauly: Denny was subject to a 2007/2008 yet-to-report Public Inquiry; it crosses a 'National Park'. In its early phase, electricity from the Pentland Firth would need this upgrade; the alternative via Aberdeen (Kintore) and Dundee (Tealing) is unavailable, as it is used to capacity by SSE's massive North Sea gas-fired power-plant at Peterhead, Aberdeenshire. Longer term, a sub-sea cable could be laid to markets in Eastern England. Several engineering firms grew up locally supplying Dounreay'; most have diversified, serving energy customers at home and overseas. At Dounreay, US employee-owned CH2M Hill has an important decommissioning management role, as has British energy group AMEC, with 20,000 UK employees; Johnson Controls, also American, has 200 staff there, while Nukem is now French and Doosan Babcock is Korean. Rolls Royce with c. 300 staff, operates the separate Vulcan establishment to test-run PWR (pressurised water reactor) nuclear propulsion plants for the Royal Navy's submarine fleet, alongside civilian the UK Atomic Energy Authority/Nuclear Decommissioning Agency complex. Hill and AMEC are partners with the UK Atomic Energy Authority in the Pentland Alliance, designed to drive the Firth programme forward; the local North Highland College, part of the nascent Highlands and Islands University, has set a target of 1,200 MW installed by 2020, implying an investment of more than �1 billion. The Nuclear Decommissioning Agency has some 'social responsibility' funds to ease the transfer to the 'new' tidal-stream economy. In late 2007, Energy Minister Malcolm Wicks toured EMEC in Orkney, before addressing a 'Caithness Beyond Dounreay' conference where he agreed that BERR (formerly DTI) could provide some funding for 'generic' Pentland Firth research; more detailed information is needed on actual seabed conditions and on exact timings of 'tide-turn' (slack water) to allow the Magee hypothesis to be tested. Early this year Dutch firm Tocardo NV announced that it was establishing a tidal generator manufacturing plant at Wick's underused harbour; once Europe's biggest herring port and the 19th century scene of the world's first powered fishing boat. For almost 30 years, the Wester 'flow-line bundle' oil and gas pipeline yard, near John O'Groats, has been an important component of the local economy; the 'bundle' concept developed there added c. 25% to the world's offshore reserves. It is now part of Norwegian-owned Sub-Sea 7, a leading worldwide offshore engineer. The 'bundles' (several pipelines within an outer steel casing) have been adapted to operate in deep waters using an innovative computer-controlled mid-water towage system for delivering lengths (to 5 kms) to the fields; this may be adaptable for Pentland Firth seabed installations. SubSea 7's expertise is but one of a host of sub-sea engineering technologies that can be modified for tidal stream generation. In April 2008, Scotland's First Minister Alex Salmond visited the US, announcing a �10 million prize for a marine energy innovation applicable to Scotland. The UK Government views tidal-stream as a new 'open' technology, where British-based companies can aspire to a world market, especially if they have 'cut their teeth' in a demanding environment such as the Firth. Thus grants for individual devices may be available. The nascent industry, through the British Wind Energy' Association's Marine Renewables Unit would prefer to see special 'Renewables Obligation Certificates' (ROCs) in place; here funding comes from a levy on consumers' energy bills. At present, a variety of generating devices are being developed; none is beyond the prototype stage, despite occasional public relations claims. Nor is there yet agreement on actual designs; should these be direct-drive or use hydraulics? Will gravity structures prevail, given the constraints (as above) and the fact that piling will be difficult, if not impossible, in the tidal streams? Should ducting be used to further speed up the water-flows? There are also propeller-less 'polo-mint' designs, with 'internal' induction coils; plus a range of other possibilities (e.g. 'sails'). EMEC exists to appraise the worth of these and other concepts. Major energy corporations are beginning to 'dip their toes' in those chilly waters; notably Germany's RWE, with Dounreay experience and local wind-farms, Norway's Statoil, which sees a big future in tidal stream harnessing at the mouth of fjords plus Scottish & Southern, with its wealth of North of Scotland heritage. A Dounreay lesson is that decommissioning should be a design feature of Firth generation deployment. An integrated approach to cabling will be necessary and steps will have to be taken to ensure that one operator does not 'block out' others from this public resource. In Medieval times, pilgrims saw themselves as putting their lives on the line by sailing across the tempestuous Pentland Firth to the magnificent shrine of St Magnus the Martyr at Kirkwall Cathedral, Orkney. This 'difficult' trip was said to be an earthly metaphor for a future journey to Heaven. Will the Firth soon provide Britain with an everlasting earthly natural power? 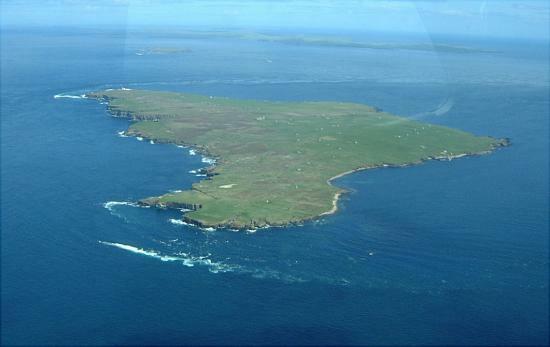 The island of Stroma in the Pentland Firth with Orkney to the north.